I don't see the mainstreams corroborating, at least, not yet. But Lord, I do hope so! Announcement will guarantee a helluva turnout in November. True or not, it may have been leaked to help fire up the base for November. Dated Sept 27. Should have been on more sources by now if true but I hope it is true. How Old Is Ruth Bader Ginsburg? 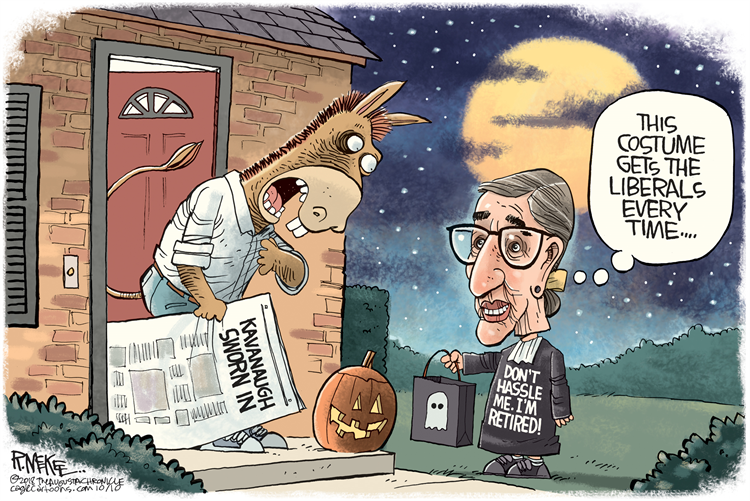 Jul 29, 2018 · Justice Ruth Bader Ginsburg said she hopes to stay on the Supreme Court until the age of 90. I want to see President Trump pre-November (or at least before Senatorial midterm election winners take office) nominate and get confirmed to the Supreme Court a 30-YO jogger of a judge who is harder-core than Scalia was. Wonder if it's possible? Yeah again, it is a bit of an older news story (If you can call Sept old lol) and I was not 100% sure if it is correct however the Santa Monica Observer is not a fake or parody site, so I figured it was worth a post. Stories like this tend to get buried once other things come up, so we will see if there is any truth to it. Either way we need to get off our ases and get the vote out. She will go sooner or later, prefferably sooner but still. January is still after November so, we do not win it won't matter. I couldn't find any confirmation either. News sources would be screaming about this if it were officially announced now. So I won't get too excited yet. Some cancer patients I know wear gloves. I noticed Gingsburg wears them too, and I was suspecting something along those lines. Too bad she didn't quit long ago while she still had somewhat of a life. Either way Trump may elect Amy Barrett, I hear she's ultra conservative. Fake or not, it was timed EXACTLY for that purpose. Just to insert some conspiracy woo into the thread perhaps the MSM is keeping it quiet until they 'win' the mid-terms. They all get their marching orders from the top you know. Though top of what is anyoen's guess. For one, she went to Notre Dame for law school, and that place has gotten more than a bit liberal, so her fitting in their is a bit of a dot. Second, she adopted two niglets, so she's neither genuinely Southern, let alone any alt-right. I'm afraid her being very pro-life, young, and with a V are going to mislead the God Emperor a bit. We certainly don't need another Souter or Kennedy. Can't find it now, but recent picture of her napping, showing huge tumerous growth on the right side of her neck near the hair line. "The future is already here, it is just not evenly. distributed." I would not wish death by cancer even for her. True; much too slow. Cardiac or the like would get her off the Court faster, where she would stop doing evil to the Republic. So it's in the best interests of the country to vote all the democrats out of office. "Vote" is overly specific. "Get" would suffice. Then we work on voting out the pinko RINO's. If this is real it will absolutely energize the left to vote in Nov. Replace the Notorious RBG will be their rallying cry. If the Dems take the Senate than there is no way Trump will get a candidate thru the lame duck session. Ginsburg was treated in 1999 for colon cancer and had surgery in 2009 for pancreatic cancer. She's survived 9 years after pancreatic cancer? NOBODY survives that long! They got it before it spread, I think while doing other work on her. Most die because it spreads everywhere, and it spreads fast, before any symptoms appear then it is to late. If Trump can't get anyone confirmed, it'll be a 8 member Supreme Court. 3 liberals and 5 conservatives. That works for me. Doesn't work for me. I want more insurance. If the dems are in power, they get us to four and five, and then one Scalia puts the court under the leftists again. I'm pretty sure the left would be happy to do that. My thought before I even clicked the link. If corroborated, the Dems will remake the senate next month. That's why, if true, it will be announced before the election. Look forward to that for the next month... not! Perhaps not, but by looking at her recently including the swearing in of Kavanaugh and her lack of engagement during interviews it's pretty obvious that mentally she doesn't seem to be very sharp anymore and her physical presentation shows someone in steep decline. She is not long for this world. Sends the message that a hard left position is not the way to win seats. I remember, from many years ago, when someone's Aunt Ruthie was at death's door. And people actually prayed for the Lord to pull her through!